Edgware Local Cars is providing transferring service and courier service in Edgware. Our firm is experienced and well known in the field of transfers. From the starting and to the end of the journey we use the best customer care tactics. We use the latest system for the cab booking that saves the booking time and provide all kind of the information regarding the booking to the passenger. We have a variety of vehicles that are suitable for all kind of journeys. Our cars are consisting of Saloons, Estate Cars, MPVs, Executive cars and 8 Seaters. Our Cars are clean so that the passenger can enjoy a fresh ride. We promise that our cars are well examined before the starting. We have recruited the greatest driving men that have the experience in driving on the routes and lanes of London. We have different offices in the area and we are aiming to expend our services in the other areas to make the local transportation easy. You can get our service by calling our phone or visit our online website. Edgware Local Cars provides chances and we recruited new members to sustain the service quality. We execute some condition while hiring the operatives like the operatives should have the validated license and at least having one year experience in PSV Registered Private Hire Driving. It is necessary to know all the areas of the London to fulfill their job precisely. We have experienced that some transportation firm recruits eastern people that can’t talk with the Passenger so we recruit carefully that driver have good communication abilities. We take care that the drivers systemize his vehicle and dress well. We serve 24/7 and have different working places in Edgware and neighboring areas where you can easily apply for the job easily. Edgware Local Cars validates that the passengers can experience the ride by having the finest customer care service in Edgware. We ensure that we establish the customer service that is available 24/7 a year; we have latest systems for the car booking and the system tells the accurate prices for the journeys. We don’t charge on the delays and the driver can wait for them. We have excellent call receiving operatives that communicates the passenger with the most sophisticated manner. We also possess the same type of service in the areas in essence Edgware, Stanmore, Harrow, Colindale and Northwood. Get a simple booking by using our app on your Mobile. Our Application is available for the Iphone and Android Users on the Playstore and Applestore. 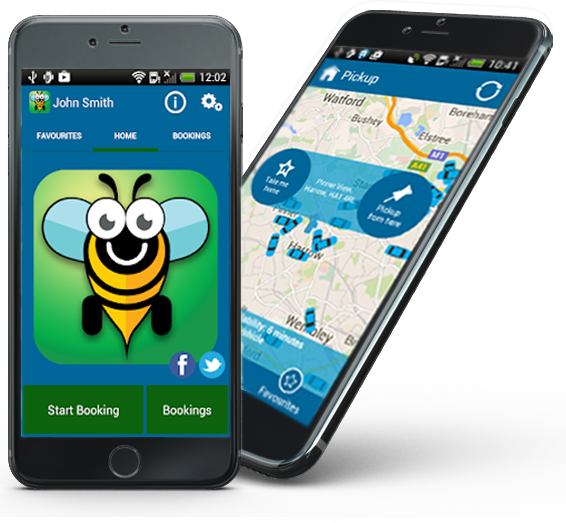 Edgware Local Cars provide mobile booking apps for both android and iphone platforms. To get the best out of our services, download our mobile apps and make your booking with ease.